“The list has plenty of people to choose from,” he said. From United States presidents to aviation pioneers to scientists and explorers, the list has something for everyone. 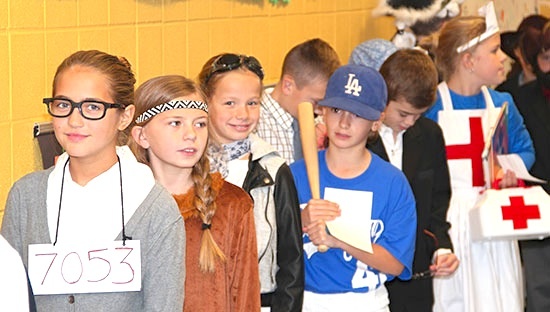 Civil rights activist Rosa Parks, Native American Pocahontas, aviatrix Amelia Earhart, Major League Baseball’s Jackie Robinson and American Red Cross founder Clara Barton waited in line with other historical figures before the wax museum began. “The kids really had a good time,” fifth-grade teacher Carrie Hoffman said. “We have worked with librarian Christine Walker on putting the list together over the past six or more years. And we’ve expanded the list to include any historical figures we have research materials for,” he added. Starting in early November, Hoffman and Autrey’s students visit the library to begin researching their historical figure. Hoffman gives her students about a week of total classroom time to prepare the paper and make a notecard for use in the wax museum. Many students work on this project and the costumes at home as well, she said. “I told the students to find pictures of their character and then try to find things around their house they can use for the costume,” Hoffman said. “It’s amazing what some of them come up with. In the spring, Hoffman and Autrey’s classes team up for a Cool Scientists Research Project in which students research scientists and dress up to share the information they’ve learned about the person.